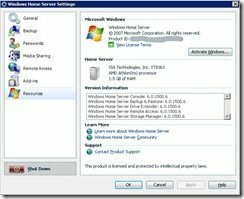 After Windows Update 6.0.1500.0 or 6.0.1500.6? I have a question for you readers, that will hopefully cure my problem. 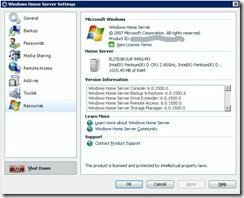 Since upgrading Windows Home Server with the update from Windows Update on the 25th September my Resources tab within Settings on the Console shows that only the “Windows Home Server Backup & Restore” item was updated to version 6.0.1500.6. All the other components remain at 6.0.1500.0. But a screen shot from a friends PC shows ALL components being upgraded to the latest 6.0.1500.6. 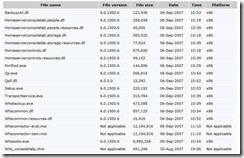 The Windows Update Knowledge Base Article KB941913 shows that all components should have been updated to 6.0.1500.6. 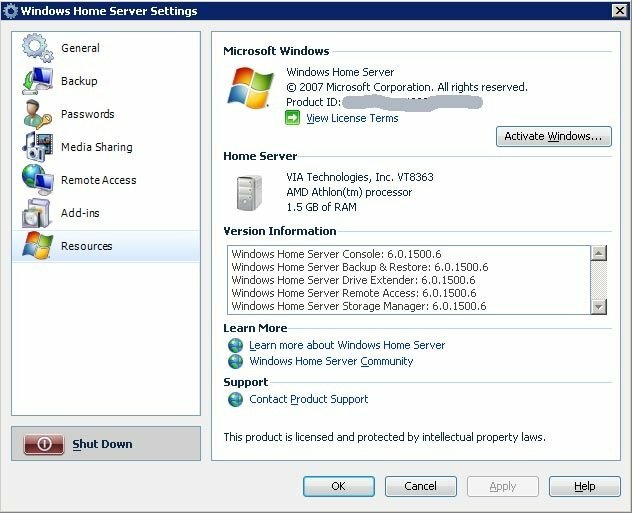 Posts within the threads here and here on the WHS Forums shows that others are still at version 6.0.1500.0 apart for “Windows Home Server Backup & Restore” which the same as me is the only item to be updated to version 6.0.1500.6. So over to you, dear readers, what should it be? I have a UK OEM version, which is a fresh install last week and I’ve applied all the available updates. Wonder if this is a problem? The backup component should be 1500.6. The team did make some changes to the backup component. I also only have the backup component updated to 6.0.1500.6 on my fresh installed German RTM version. I only show the backup component as 1500.6 as well. I have the English US version and my resources tab reflects what yours does as well. 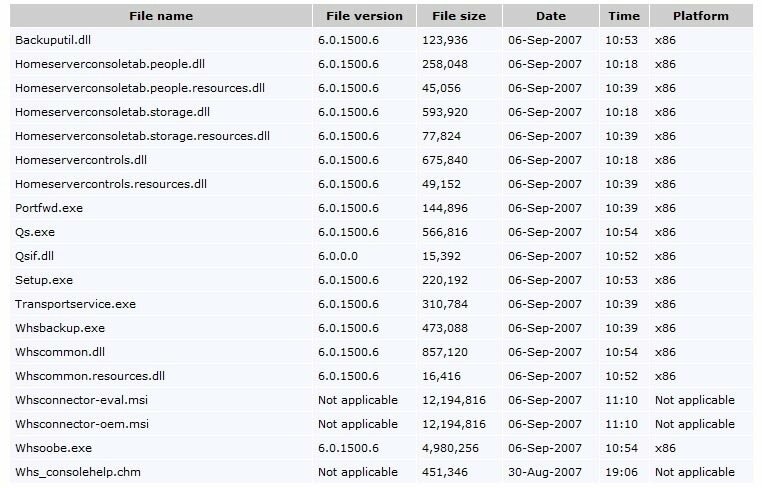 On the other hand, checking the actual files on the Program Files\Windows Home Server & subdirectory files by right clicking on them individually and selecting the properties tab shows that all, save two, are version 6.0.1500.6. The two exception files which are included in the Windows Update Knowledge Base Article KB941913 (Qs.exe & Qsif.dll) are NOT listed at all here! So, to recap, for whatever reason I have the updated files with the two notable exceptions cited but the resources tab doesn’t reflect this. I forgot to mention in my previous post that this was a fresh install. I see you used the screen shot of my OEM with the 1500.6 on all attributes. Hmmm, mine is OEM USA, not sure if the UK/German version is different or not. This is an area where I know little about. Still curious to hear why. Have you logged into WHS and gone directly to the MS update site and done a scan there? My UK English version and the US English are both the same version known as CCQ-00015. 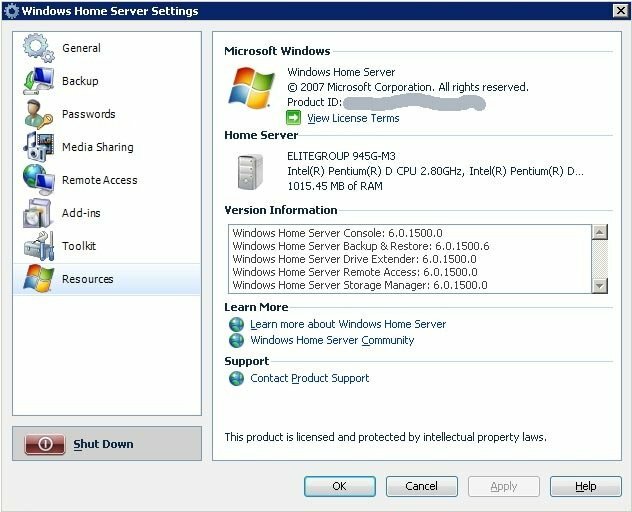 I have also run Windows uipdate directly from the server machine. Thanks for your replies. I uninstalled the update from Add/Remove Programs directly on the server and re-installed using Windows Update, but still the same (left hand now scratching my head). I just blogged about this in my blog and the forums. Thanks for the info. It confirms what I heard from another source as well.